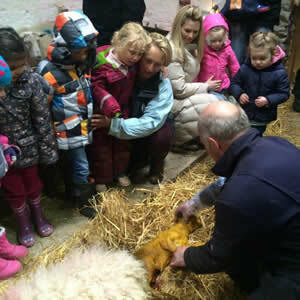 Come and join us at Knockaloe Beg Farm every Easter to welcome hundreds of lambs into the world! 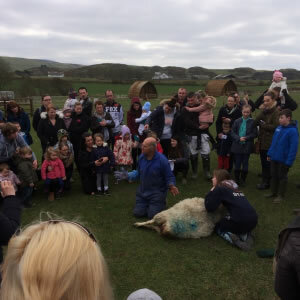 If you are pregnant doctors advise you don’t attend farms where lambing is occurring. No dogs. Too many sheep! 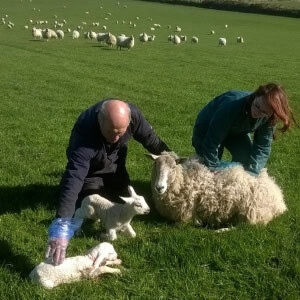 The session will include seeing the new born lambs, feeding any orphans with bottles (hopefully not too many! 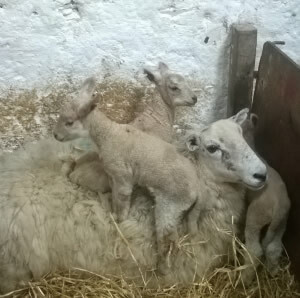 ), going on a trailer ride to feed the ewes still outside and maybe sneaking a peak at our other animals if the lambing is not too busy. Please be vigilant with your children about not putting their hands in their mouths at all and very good hand washing after touching the animals. All clothing that has been in contact with the animals should be washed when you get home and shoes/boots must be cleaned and disinfected BEFORE and AFTER visiting the farm to protect yourself and our animals. PREGNANT women should avoid visiting the Farm between mid-March and the end of April when we are lambing. The Farmer’s Rest Cafe will be open 12-5 each day for delicious home cooked food and lots of cake! for up to ten guests in our guest house accommodation on our working farm at Knockaloe Beg. for up to 6 people in The Stables, and 4 people in The Byre in our converted farm buildings near Peel, Isle of Man. for up to 8 people in The Bunk Barn, and 2 people in The Bothy; simple hostel-style facilities for those on a budget, but enjoying the same idyllic surroundings. A first for the Isle of Man. We can accommodate up to 8 people; 2 luxury cabins are available, sleeping 4 people each.